After the lull of the past couple of episodes, I feel like we’re finally building towards something - we’re finally getting somewhere! 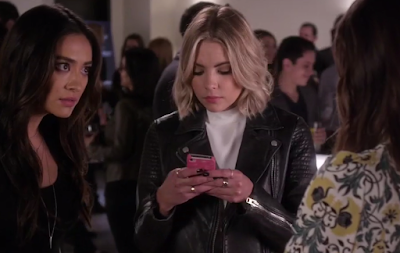 There were a lot more clues revealed and it felt like old times with all the Liars interacting and working together. I’m going to start with how I felt about all the girls individually and save a lot of the discussion of the OMG! moments for the end, so let’s jump right in! Emily felt way more involved this week, Sara was away which allowed this to happen. 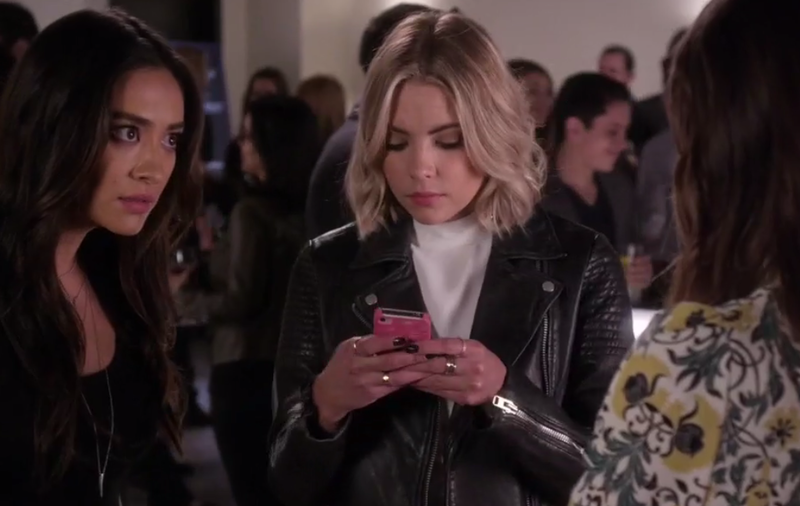 Not only did she have a really nice scene with Aria where they just caught up and talked about normal things like relationships and clothing choices, but she also was much more involved in investigating A. She went along with Hannah and Spencer when they followed Rhys and it was nice to see her interacting more with the other girls again. 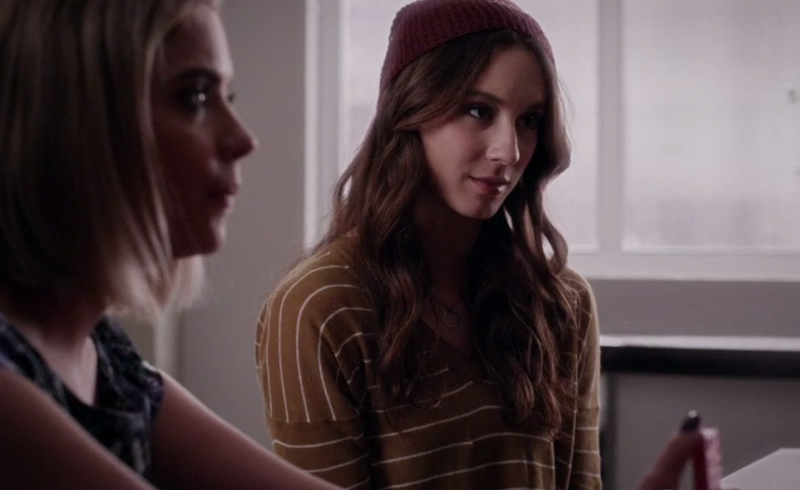 I felt like Spencer kind of took a backseat this week. There wasn’t that much focus on her as a character and everything she did was with someone else who had a more noteworthy story. However, she did come up with a really good idea that had me wondering why the police haven't come up with it already. At the beginning of the episode Spencer suggests that the police just do one of those age progressions on the picture of the boy from the birthday party video that A left for Ali. This is so obvious and part of what makes this show so completely unbelievable. If this was the real world, the police would have done this right away, yet another way in which the Rosewood PD are a total mess. This was a big episode for Aria and she had a lot going on. 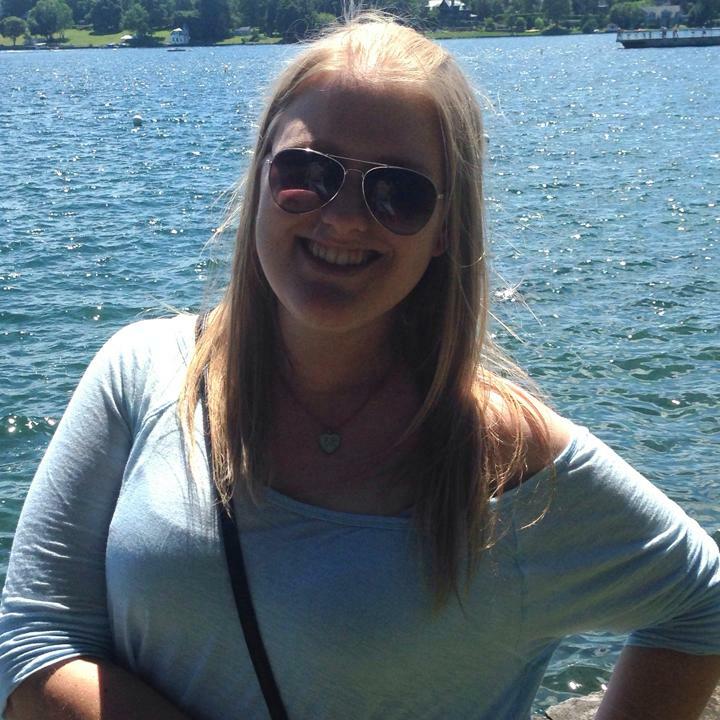 She was up for an art scholarship and her work was being showcased at an art gallery. I was really happy for her because she’s my favorite character and I want good things for her, but of course A had to go and ruin it. On top of that, my favorite couple Ezria seem to fall apart more and more every week. 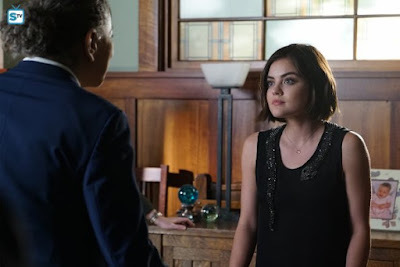 I was so hoping that Aria would ask Ezra to prom, which admittedly would probably be super weird and awkward for him, but I was really annoyed when that new girl came into the picture. Just when they’re trying to reconnect something else gets in the way. However, they did have a really nice scene outside the art gallery after everything went down and I really have to compliment Lucy Hale because she did a great job with the emotion of that scene. The other important discovery this week was that there’s definitely something going on with Clark. I’ve spent the past couple of weeks liking him, hoping he’s not involved with A, and writing off any of the sketchy things he does and now there’s undeniable proof that he’s not just a nice, random new character. He started out this week the same as usual, asking a lot of questions about A and how close they are to catching him but this week Aria and Ezra both seemed to think it was weirdly excessive. 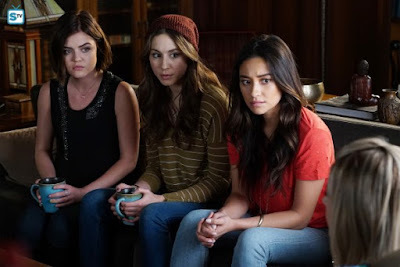 By the end of the episode things had escalated substantially, with the Liars seeing him potentially heading into a meeting with their A prime suspect. I’ll discuss my thoughts on this rendezvous more towards the end of this review but for now just know that I don’t think this is what it looks like - it rarely is with this show! Hannah was way insensitive this week, even more than usual. She’s alway been a bit “no filter” but this week was pretty extreme. I feel for her and in a lot of ways agree with what she was saying about A/Charles but it’s still harsh, especially to say in front of Ali, who obviously doesn't feel the same way. But it wasn't just Ali that she didn't seem to care about. At Aria’s scholarship event it took a lot of convincing for her not to ruin Aria’s night by telling her about their meeting with Rhys at the Carissimi Group. 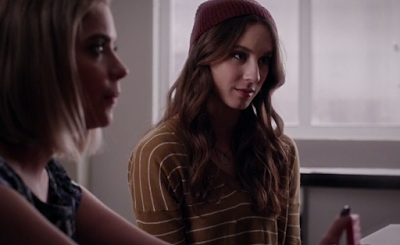 The experience in the dollhouse has affected all the girls but for the others it seems much more internal, whereas for Hannah, it’s caused a big outward change in how she presents herself and in her relationships. It’s clear she’s had enough and is ready for this to be over and I really can’t blame her because so am I at this point! I’m not a huge fan of Lorenzo and Alison. It’s just creepy to me that he’s so much older than her, and I know as an Ezria shipper some people may think that’s hypocritical but I think that what makes Ezra slightly less creepy is that he recognized what was happening was wrong and he questioned it and ended it many times out of guilt and wanting better for Aria, whereas Lorenzo, even though he’s a cop, just seems to have no issue with dating Ali at all. He’s never even brought it up. Now I don’t know if he’s a similar age to Toby (which, if so, fine!) but he certainly looks a lot older and I just don't see the chemistry between them. 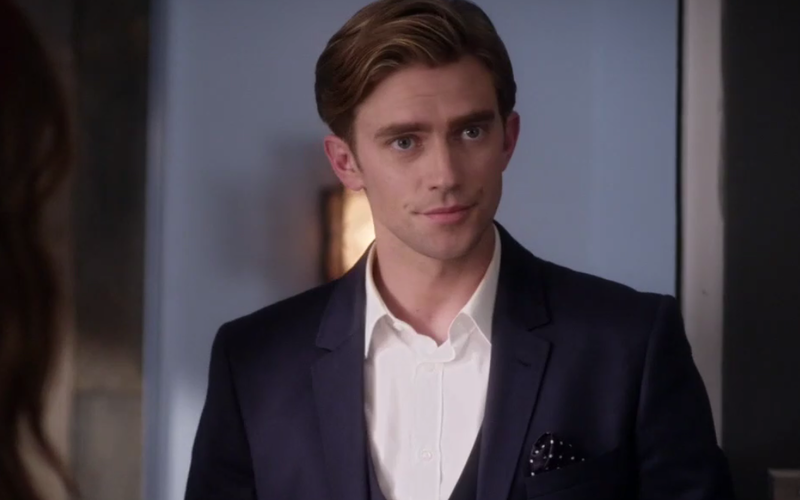 I was happy this week when he found out that Ali had used him, despite her intentions and how much I believe she’s changed her ways. But I know they'll just get back together anyways, so I won’t even bother discussing them anymore. Surprisingly, a lot happened in this episode. My guess is they’re desperately trying to play catch up before the finale after wasting the last three episodes with filler. We saw the return of Red Coat, who is still a mystery but we know they're back with A and helping him/her in some capacity. 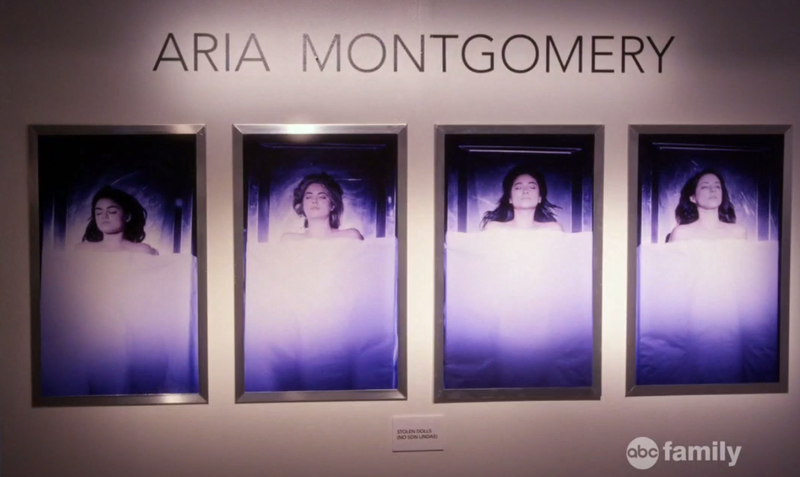 Aria’s scholarship event was ruined by A replacing her pictures with images of them from the dollhouse morgue incident with the caption “Stolen Dolls (No Son Lindas)” meaning “They aren’t pretty” or “They aren’t Linda’s”. Det. Linda Tanner takes this as a personal message to her, which I found interesting. We also met someone involved with the Carissimi Group. I loved this part so much. It was chilling when Rhys walked into the office and he looked so much like Jason. They really did great casting for that. I don’t know if the actor who plays Jason has a brother and they used him or it was just luck but he really looks like Jason’s twin or brother. My theory is that Rhys is Charles. But not A. I no longer think that Charles is A. I think that’s what A wants them to think. There’s no denying that Rhys is related to Jason and Alison, so he has to be their long lost brother but I just don’t see A showing their face like that and being that visible. A is an expert at hiding their tracks and being unseen, yet outside the art gallery it took them all of two seconds to spot Rhys across the street. I think Rhys and Clark are connected, they’re friends or working together in some way but they’re working against A and trying to figure out who is setting Charles up and why. Just like the Liars are. This is the only thing that makes sense to me, him being A is just too obvious at this point. I’d also just like to point out how hilarious it was when Aria’s mom said “Are we just supposed to solve his riddles now?”. Since when have they ever not had to solve A’s riddles - keep up! Overall, I think that Wren is A - it’s a popular opinion (maybe too popular!) but I’ve just always felt that it’s him. 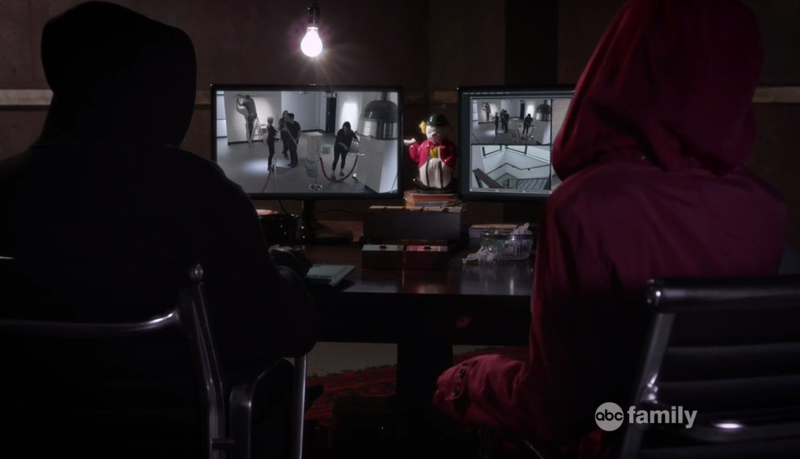 I never really had a theory about who Red Coat is but after last night’s episode I’m feeling 99% sure that it’s Sara. It’s just too convenient that as soon as she ditches Emily and isn’t around for an episode, we see Red Coat again. It just must be her. And it makes sense, we know she spent a lot of time with A in the dollhouse, but maybe she wasn't his prisoner. Maybe she chose to be there with A and then pretended to be a prisoner to gain their trust and become an “inside man”. I don’t know, these could end up totally wrong! But I feel pretty confident that these last couple of episodes before the finale are going to have a lot of red herrings to throw us off, so just like Ezra, I’m not trusting anything or anyone! It’s been really fun taking over for Gavin while he’s been away, but he’ll be back next week just in time to review the final two episodes of 6A. I’ve really enjoyed discussing this crazy show with you in the comments and I hope you’ve enjoyed reading my reviews! Hopefully we’ll get all the answers we’re looking for soon! Let me know what you thought of last night’s episode in the comments and thanks for reading!